At about noon we were back at Harbin Taiping Airport to meet up with the rest of the tour group. The flight was late by an hour so by the time the entire group of 11 tourists, one Tour guide from Singapore an another Tour guide from Harbin met it was closed to 1 pm. We all scrambled across the road outside the airport and got onto our bus. It was a huge bus so each of us took two seats and there were still many to spare. Our guides told us that this big bus would be our main vehicle of transfer for the next 10 days. 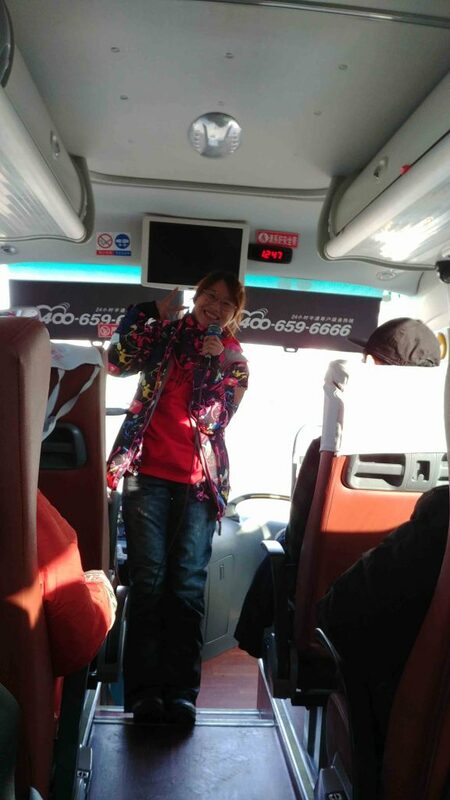 The first advice our Harbin guide gave us was about layers and dressing up for the cold weather. 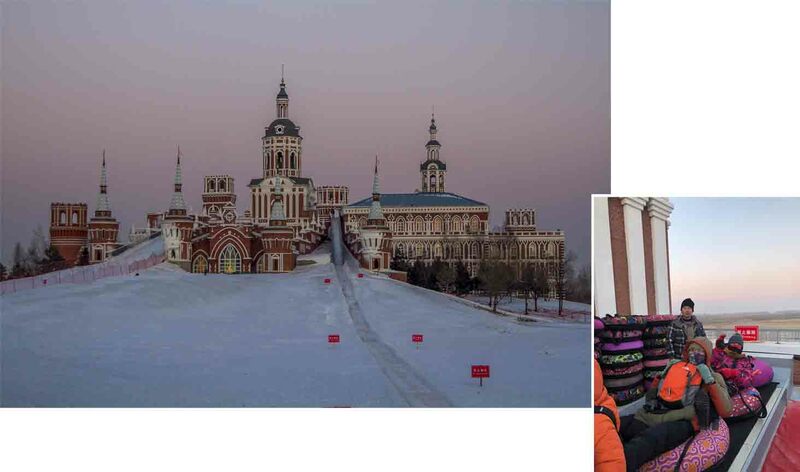 Our lady guide was a young Harbin native, so we should be able to “trust” her. She told us that for every destinations that we would be visiting she would be advising us the layers we needed to put on. There would be many times a day we would need to putting on layers and taking off layers as we move from outdoor to indoor. She inspected our “warm clothes” and “boots” and all our winter boots did not seem to meet the expected grade of outdoor (snow and ice) walking in Harbin. On the way to our first sightseeing destination our guide brought us to “shopping”. We were all shipped to a “warm clothes” outlet. We got Harbin winter boots, it looked like plastic boots with thick corrugated outer soles and wool lined interior. Ugly but necessary! Yat Thong and I was reluctant to buy the local winter boots as we had bought Timberland winter boots for this Harbin trip. The Timberland salesperson had vouched for their effectiveness against the cold. 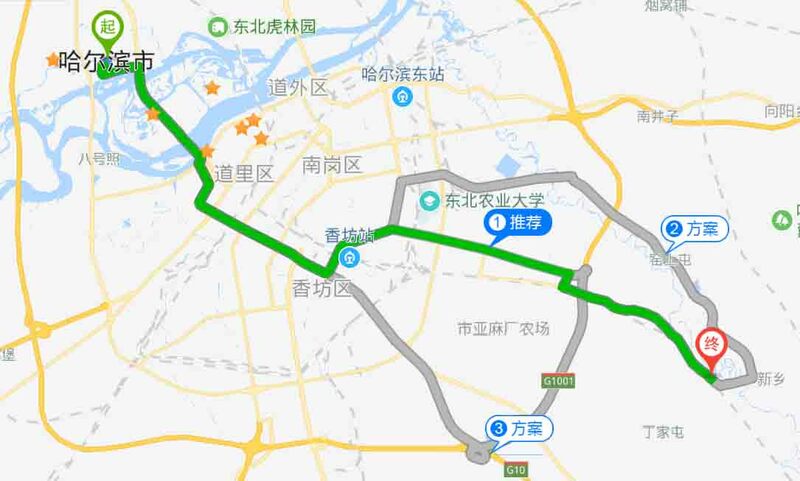 We were not sure if we were taken for a ride – to spend unnecessary by our Harbin guide. We consulted with our Singapore guide (from Dynasty Travel) who had visited Harbin many times. He confirmed from his personal experience that he too owned a pair of Timberland winter boots and they were good only for walking in the street of Harbin. As for trekking on ice and deep snow the ugly boots provided better protection. The boots costed about ￥210 a pair, we bought two pairs and a thermal pants for another ￥210 for Yat Thong. The thermal pants was just a precautionally measure as Yat Thong was was not afraid of cold. I saw the same thermal pants being sold in Singapore and it cost twice as much! It was already after 2 pm when we were finally off to Volga Manor where we would stay for a night. 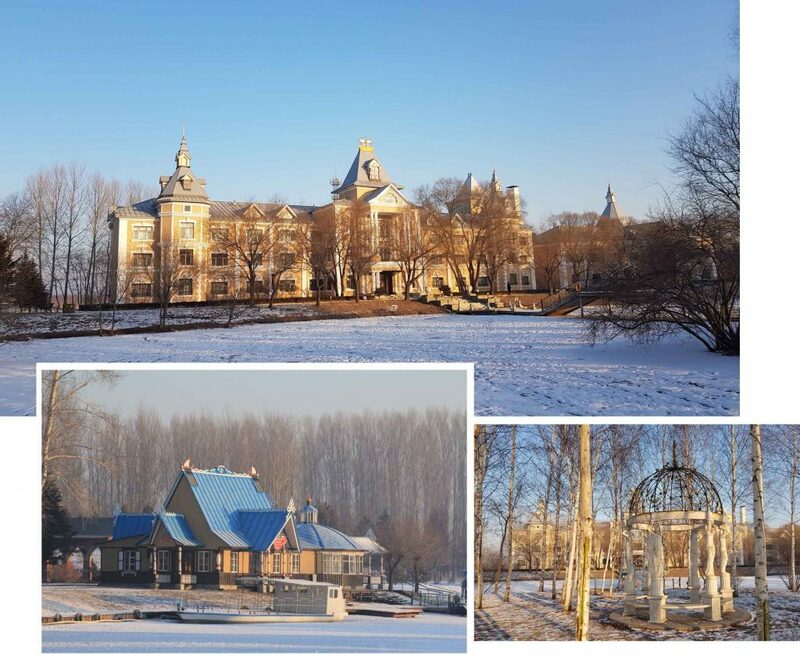 It was about an hour drive to Volga Manor which was located in Xiangfang District of Harbin. 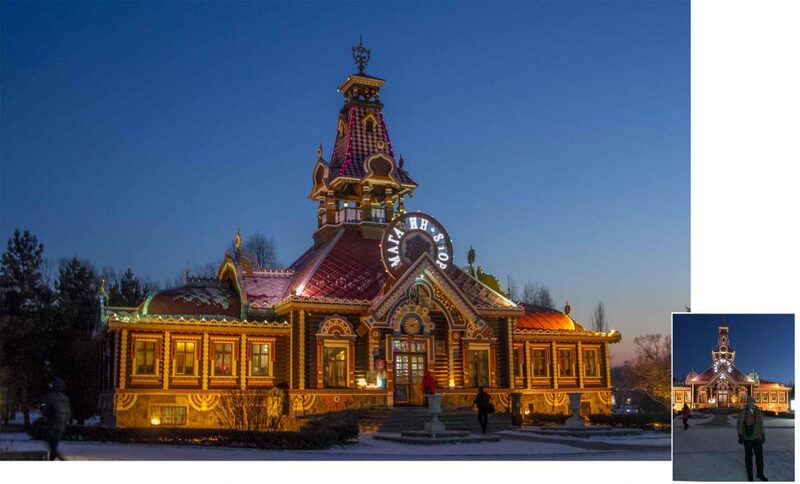 Volga Manor was a huge Russian Theme Park/Tourist Resort covering an area of 600,000 sq metres. 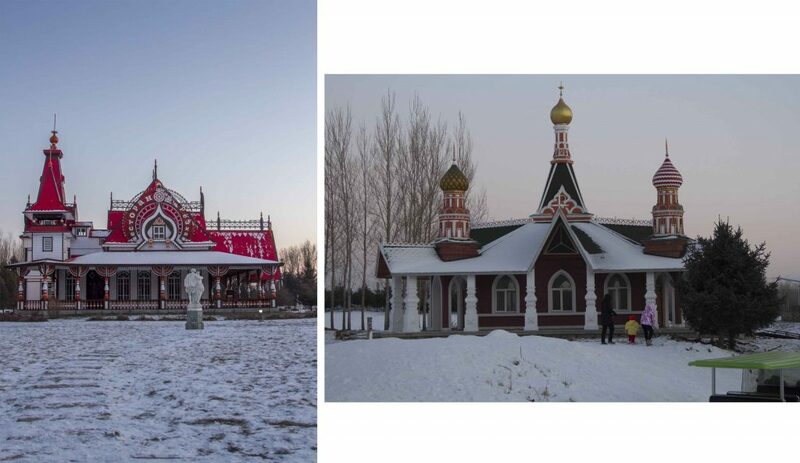 There were over 30 Russian style buildings within the park and was considered one of the best place to see Russia without leaving Harbin. 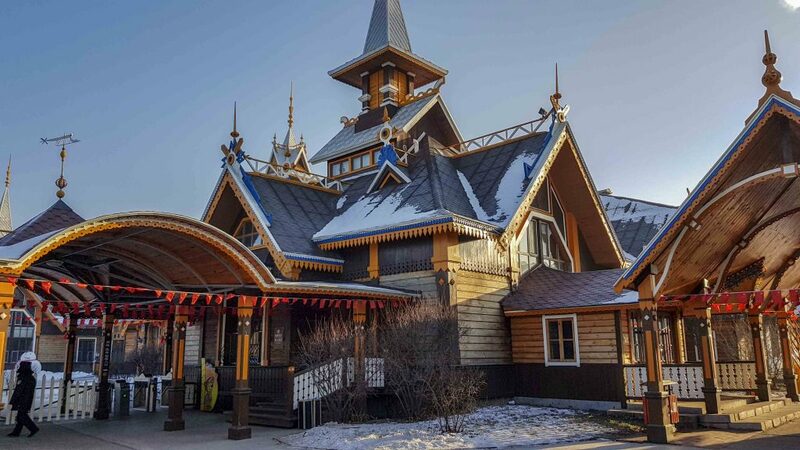 Our bus stopped just outside the park entrance which was a beautiful and colorful wooden building with angular roofs. We left our bus, crossed the entrance and dragged our luggage a short distance to the main hotel where we would be staying for the night. Though it was a short walk we could feel the freezing breeze brushing our faces and could wait to get into the hotel. The hotel lobby was very nice/rustic looking and warm. The place seemed rather empty and quiet. Our guides were very efficient and we were allocated our rooms in just a few minutes and given about 30 minutes to freshen up before meeting at the lobby again. Our room was on the second level. It was pretty big and comfortable. The attached toilet was huge and clean. Sadly it was a room with no view outside the window. No view no issue, since we were staying a night at Volga Manor we had plentiful of time to explore. In the freaking cold weather we were rushed to the grand tube ride as it was near to closing hour. We were put on an electric tram which transfered us to this huge majestic brick building (castle like) with a long slide that started somewhere on the upper level of the building and stretched all the way down to the ground. Each of us sat on a colorful tube and stretched our legs to the person sitting on another rubber tube in front. The front person would grabbed the legs of the back person and this was how 13 tubes (11 visitors and 2 guides) were connected. A conveyor belt delivered the tubes to the start of the slide and off we go. A fast and quick ride and it was over in two minutes. The “fun” was charged on a per ride basis. After the tube ride we had about two hours (until 6 pm) to explore the ground. Being winter the sun would set at about 4.30 pm so we could catch some sunset scenery. The ground was huge and looked deserted. We moved from one Russian looking building to another. 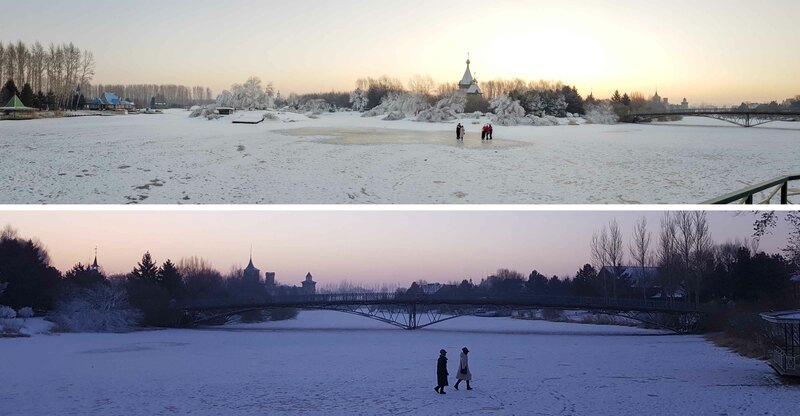 We walked on the frozen lake which had became a vast empty land. The weather was very cold and our hands and faces suffered the most. Very soon my handphone (LGG6) “died” due to the very cold temperature and the heat pad that I had sticked to the back of my phone seemed ineffective. My phone still had 50% battery but it just blackout. The only way to revive it was to plug it to a power bank. It was a great thing that my DSLR camera had no problem. Unfortunately it was difficult taking pictures wearing ski gloves. As for the faces/cheeks, we could only protect them using our neck gaiters. Unfortunately the hot breaths from our noses escaping through the top of the gaiters kept misting up our spectacles! Neck gaiters or spectacles, one had to go. Without the neck gaiters the air coming into our noses felt spikeful so we had to sacrify the spectacles! Since we arrived late at Volga Manor we missed the “Russian Dance” performance so the host arranged for a two dance items to be performed just by our dining table as a “replacement”. Just before the meal was served four dancers and a singer came by to perform for us. I wondered what we had missed in term of the entire one hour performance. Too bad we were late. 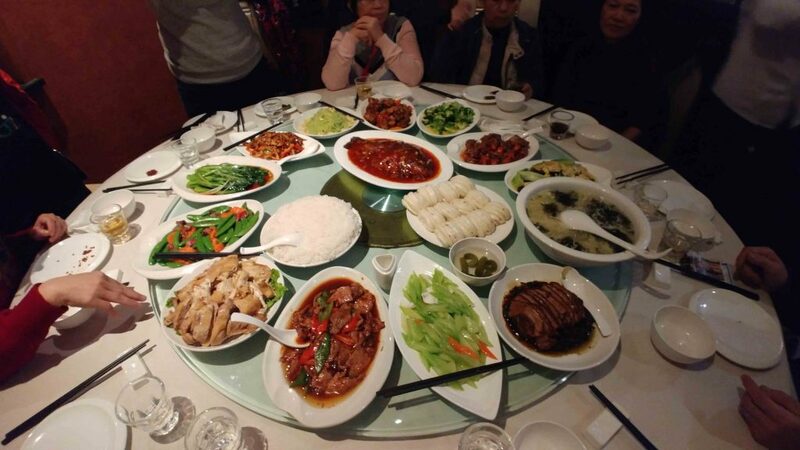 Dinner seemed pretty “Chinese” with 15 huge dishes, definitely more than enough for 11 hungry tourists at a round table! The next morning after waking up we had to put on many layers again to go for breakfast. The breakfast restaurant was about 200 metres from the hotel and the temperature was about – 10°C. It was about 7 am in the morning and the sun still had not risen yet. The short walk to the restaurant was rather scenic, mystical and stunningly “cold”. We arrived at Volga Manor at about 3pm the day before and left the next morning at 9am. Generally we felt that our time at Volga Manor was too short. The place was huge, sunset and sunrise over the white “winter land” was stunning. When we were walking outdoor though the scenery was spendid we could not stay long as the sub zero temperature forced us to seek out the warm in the hotel. But when we were indoor the beauty of the surrounding was so captivating that it pulled us out of the hotel again. We felt that if we had more time at Volga Manor we would have the time to explore the many different parts of Volga Manor with intermittent “warm” reststops. 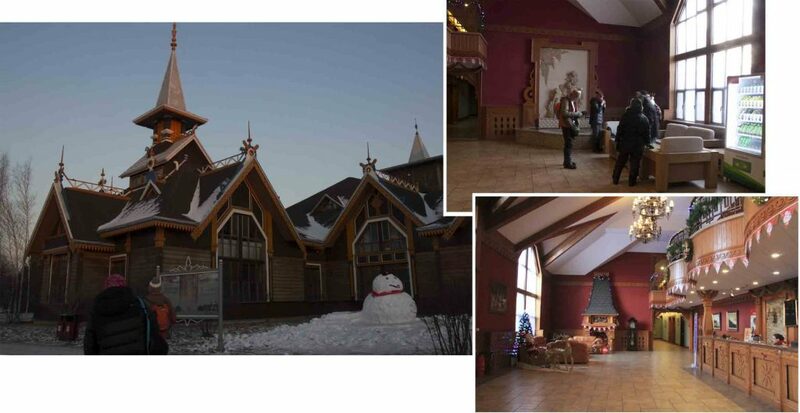 This theme park had 30 Russian style buildings but with our limited time we had no chance to see even half of them! 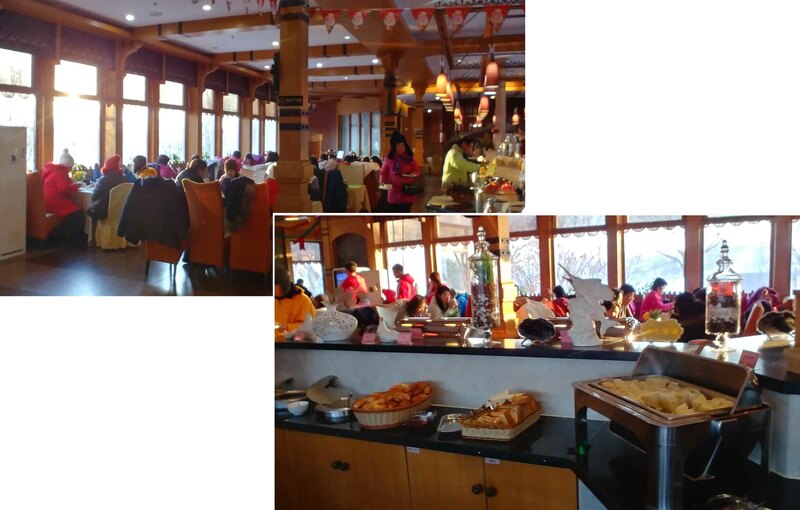 We were very surprise to see the restaurant full of people at 7.30 am in the morning. We hardly see anybody around in the evening before when we roamed the ground and even in the hotel we did not meet any other visitors except those in our group. Where did all these people come from? Breakfast was pretty “plain” definitely not as nice as our dinner we had last evening!